Luke Bryan has announced a preliminary schedule for his fifth annual Farm Tour, beginning in October with eight southeast concerts, including five in his home state of Georgia. The ACM Entertainer of the Year will kick off the outing Oct. 2 in Statesboro, Ga. and wrap on Saturday, Oct. 12 in Valdosta, Ga., all the while delivering scholarships to students in the communities played. Last year, eight scholarships were given to students from farming families. The idea for the Farm Tour came as a way for Bryan to give back to local farming communities by celebrating and lifting up the American farmer and offering a fun escape with the outdoor shows. Over 100,000 fans came out for last year’s tour, which doubled the previous year’s attendance record. With the exception of Athens and Tallahassee, ticket presales for the 2013 tour will begin for fan club and Citi card members on Tuesday, July 23 at 10 a.m. ET. Public tickets will be available starting Friday, July 26 at 10 a.m. ET. 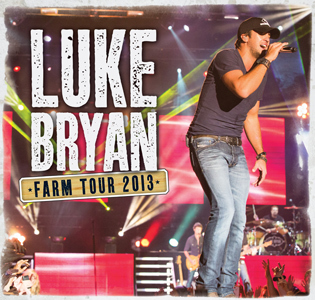 For additional Farm Tour 2013 information, click here. Oct. 9– Villa Rica, Ga.